This is that ever wonderful page that one has no idea when they create it what will go on it. On the other hand I realized that as busy as Garden of Friendship members are, I would have some amazing things to put on it that just don't "fit" anywhere else! Enjoy! Adoptions: GOF member and committee adoptions received. Littlest Angel Dedication page: I was visited by "Littlest Angel in July of 08" Here is her page. 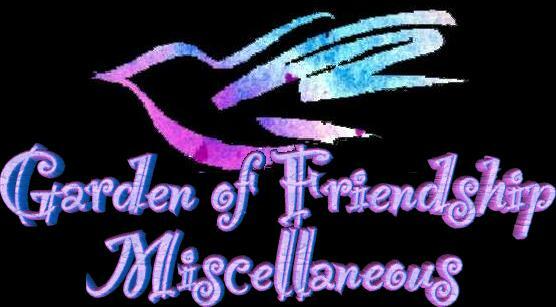 Garden of Friendship Eighth Birthday Bash: GOF birthday celebrations are amazing! See all the beautiful gifts I got and if you didn't get a gift, there are mine for GOF members on this page also! Halloween Secret Pal 2008 : GOF Secret Pals are so much fun! See all the beautiful gifts and cute sayings I received!